Sometimes, finding a vacuum that works for your hardwood floors is tricky. If you also need one that picks up pet hair, it gets a little more complicated. Thankfully, we’ve done our research to bring you the best vacuums for both pet hair and hardwood floor messes. We’re sure you’ll find a vacuum cleaner that will work for you on our list. Here are some things you should know before we get started. Type: Our list hosts a few different vacuum types, from your standard upright vacuums to compact stick vacuums. Canister vacuums with huge, rolling dirt containers are feature here, as well as robotic vacuum cleaners (like the Roomba). 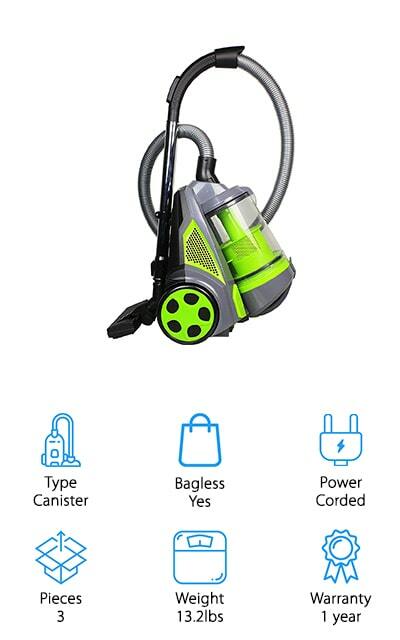 Bagless: Bagless vacuum cleaners usually have a dirt container or cup, and you never have to worry about a bag being full or replacing it every few sessions. We’ll let you know if it’s bagless here. Power: Vacuums can come in either corded or cordless varieties, and it’s up to you - choose the style you prefer. Cordless is less hassle, but you have to charge the vacuum between uses for best results. Pieces: How many pieces come with the vacuum? This includes charging stations and accessories. It’s important to know what you’re buying so you can make an informed decision about which vacuum you will prefer to buy. Weight: How much does the vacuum weigh? This is important if you’re going to be taking it up and down the stairs often, or if you have restrictions on how much you can push and pull. Warranty: A warranty means a company stands behind their product. If it breaks during normal use within the time frame, you can get a replacement or a refund at no additional cost and with no hassle. Now that you have all of that information under your belt, it’s time to get to the vacuums. Through our research, we’ve found the best vacuums for pet hair and hardwood floors on the market right now. Our top pick and budget pick are our favorites, so check them out first before moving through the rest of the list. Your floors will thank you for using these amazing vacuum cleaners! We found the best Dyson vacuum for pet hair and hardwood floors, and it’s the V8 Animal Vacuum. This cordless powerhouse can run for up to 40 minutes on the regular setting, though that cuts down considerably if you’re using the motorized tool or direct drive head. The filter will last you a lifetime and can be washed out after each session to last an incredibly long time. 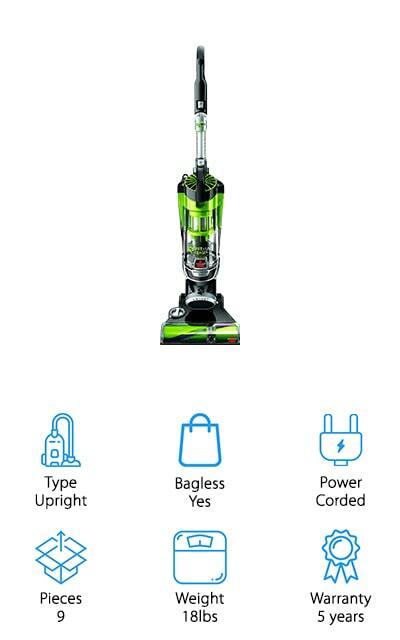 This vacuum is lightweight and comes with a neat feature: an instant-release trigger so that you only use battery power while you’re cleaning. It cleans allergens off of your floors and excels in picking up pet hair, even on hardwood floors. It even grabs the fine dust and locks it away, for floors that you can be proud of. When you go to empty the dirt cup, you don’t have to touch the dirt – it has a hygienic emptying function. And it works on carpet as well! 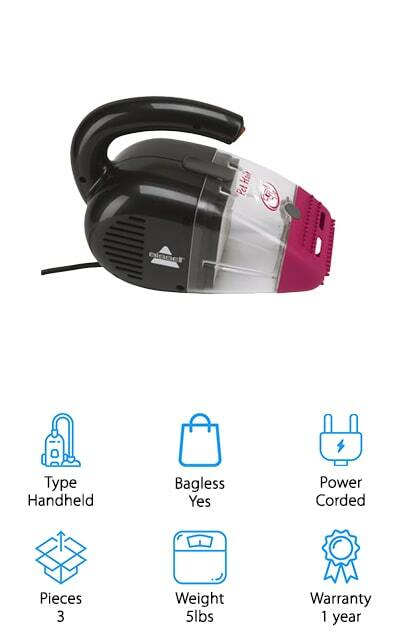 This Bissell Pet Hair Vacuum is a compact corded hand vac that you can use to clean stairs, upholstery, and the edges of your hardwood floors. There are two nozzles designed specifically for getting in edges and tight spaces, and it includes a rubberized nozzle to attract hair on carpets and hardwood. If you often have pet hair gathering on your hardwood floors, vacuum it up with this amazing handheld system. It features multi-level filtration and the Cyclonic Cleaning System, which ensures that you’re getting the most powerful suction and the best clean possible. The power cord is 16-feet long so you won’t have to worry about not being able to reach. The dirt cup is easy to clean and can hold up to 0.78 liters of dust and dirt. Don’t let fine dust particles gather on your hardwood floors – get them up with this amazing handheld vac. It cleans up pet hair better than other handhelds! The Rocket TruePet is an amazing Shark vacuum for pet hair and hardwood floors. It’s a stick vacuum in its initial form, but it’s lightweight enough to convert into a handheld. Get your clean on anywhere with this vacuum! At less than 9 pounds, it’s light enough to maneuver however you’d like. There are LED lights on the hand vac portion so that you can get to those dark, hard-to-reach places and see exactly where you need to clean. That’s super useful! Plus, the dust cup is extra-large, and that extended capacity means that you can vacuum for longer before you need to stop and empty the cup. It comes with a pet multi-tool to get those pesky pet hairs out. This hardwood floor vacuum is fully capable of dealing with stuck-on debris as well as surface litter so that your floors stay beautiful and comfortable no matter how many pets you have! You’re going to love this vac! The Hoover WindTunnel is another vacuum that is super lightweight. It’s upright, and usually, they are much heavier. 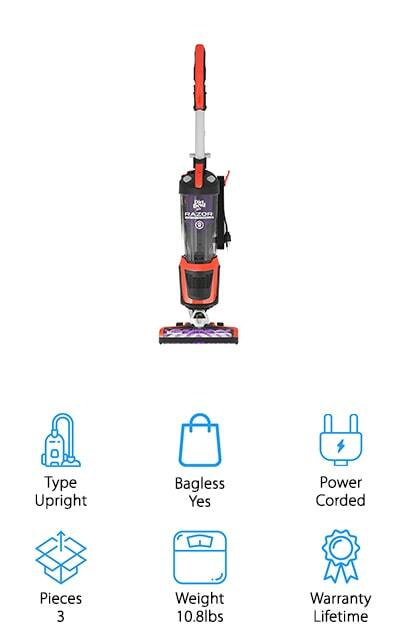 However, this vacuum comes in at only 19 pounds, so you can take it wherever you need to go and it isn’t a hassle to push it around. There are five different height adjustments for longer carpets as well as harder floors. The 25-foot cord retracts and winds itself into the machine so that it’s stored inside. You won’t have to rewind it every time, and it’s much neater that way. The Rewind comes with an Air-Powered Pet Hand Tool that can easily get all of the pet hair up off of your floors, an Upholstery tool for furniture, a crevice tool for edges and tight spots, and a 12-inch extension wand so that you can reach and clean just about anywhere. Plus, if you’re low on space, this vacuum can be stored in small places with its folding handle. Bissell’s Pet Hair Eraser is a good vacuum for pet hair and hardwood floors both, and comes with some nifty pet tools that will help you get pet hair out of all of your surfaces. It includes a tangle-free brush roll, which is super handy when it comes to picking up pet hair. However, it comes with a patented cyclonic pet hair system that spools the hair for easy emptying of the dirt cup. 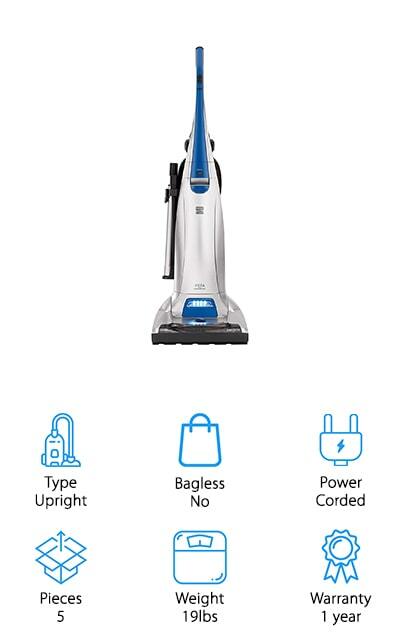 It cleans an entire 12-inch path over your floors, and you can clean a huge area with the 30-foot power cord. For that extra bit of reach, there’s an 8-foot hose to help you reach ceiling fans and under your furniture. The included crevice tools come with LED lights to help see into dark spaces, and the Pet TurboEraser Tool gets hair out of carpets and upholstery, and it even comes with a Febreze Pet Odor Eliminator in the filtration system! Black+Decker makes one of the best vacuums for pet hair and hardwood floors and carpet use as well! The Airswivel can do anything, and it’s super lightweight at only 8.8 pounds. The dust cup can hold an amazing 2 liters, which means that you won’t have to stop and clean the dust out in the middle of your vacuuming. It comes with a 25-foot cord so you can clean a wider area of your home at once without having to jump plugs. The handle is ergonomic, and the dust cup is easy to empty without ever touching the dirt. The filters are made of foam and they are all completely washable. You can clearly see the dust and dirt as it collects in the cup, so you know when to empty it. One of the coolest things about this vacuum is the swivel steering so that you can maneuver the vacuum easily throughout your home, even in tight corners. iLife’s V3s Pro is the best robot vacuum for pet hair and hardwood floors that we could find. IT has specific pet hair technology that helps to focus on picking up hair as well as dirt and debris. 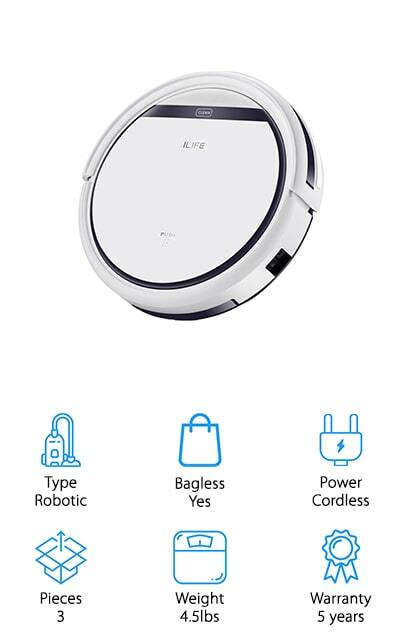 It has amazing suction power for a robotic vacuum. It can clean under all of your furniture, including under the bed, due to its low-profile design. Dirt won’t be able to hide from this vacuum. It charges itself, and you can program it to run on a schedule. It has smart sensors to it won’t bump into walls or furniture, and it can detect stairs and other drop-offs as well. This robotic vacuum is actually ideal for hardwood floors because of the way that it works. If you need to operate it outside of the schedule, you can do that with the remote control. You determine when it cleans! Replace the filter each month and you’re good to go. This upright vacuum by Kenmore is an amazingly powerful machine that boasts two separate motors. It also includes Power Flow technology that makes sure your suction doesn’t lose power and that there’s nothing left behind, whether you’re cleaning carpets or hardwood. It has a triple filtration system, all HEPA filters that help to get the allergens lifted out of your carpets and off of your floors. It’s great for people who suffer from allergies and asthma, as it makes the air more comfortable to breathe. There are four different floor height adjustments for carpets and hard floors, and there are LED headlights on the front of the vacuum so that you can see where the dirt is. 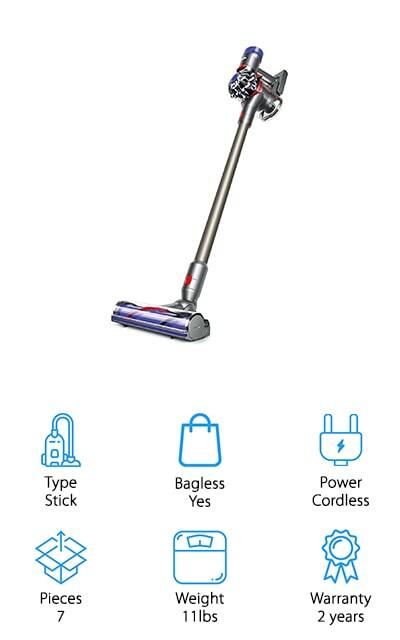 It even comes with a telescoping wand that reaches 10 feet from the vacuum for optimal cleaning! The cord length is 30 feet already, so you can reach the whole room without moving the vacuum to a different outlet. Ovente makes the only canister vacuum on our list. This powerful machine has non-stop suction rated at an amazing 1400 watts. 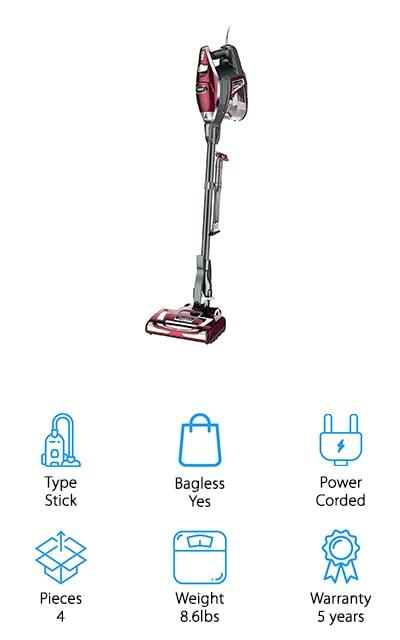 No matter what surface you’re cleaning, you can get it done in one pass with this canister vacuum. It’s lightweight, which you might not expect, but it only weighs about 13 pounds. Plus, it comes with a ton of attachments to get your surfaces clean, including a brush and crevice nozzle, an upholstery tool, a telescopic metal wand, pet brush, and multi-angle brush. The translucent dust compartment alerts you when it needs to be emptied with an LED light, which can also alert you to a dirty filter. The power cord retracts, and the hose swivels and bends a full 360 degrees to clean in any part of your home. It works to trap allergens and bacteria, so your home is cleaner on multiple levels! You’re going to love how spotless your home is with this vacuum! Last but not least, we have this Dirt Devil vacuum for pet hair and hardwood floors. The Razor comes with a 10-foot extended hose so you can reach all sorts of areas outside of the vacuum range. It’s an upright vacuum that is made with technology that guarantees there will be no loss of suction over time. It includes a premium brush roll to powerfully clean your entire floor, as well as a 2-in-1 crevice tool and a dusting tool to make sure you’re getting the most from your vacuum. This vacuum has swivel steering and a low profile, allowing you to zip around your house, under furniture, and around sharp corners with ease. It works perfectly on dense carpets, low-pile rugs, and hard floors of any type to pick up pet hair and dander as well as fine dust. The dirt cup is extra-large so you can vacuum up more at one time without having to pause.